· “Change is the only thing that does not change in society”. · Change is the most permanent features in our society. · The term social change is used to indicate the changes that take place in human interactions and interrelations. · According to Morris Ginsberg social change is a change in the social structure. · According to Jones “Social change is a term used to describe variations in, or modifications of any aspect of social processes, social patterns, social interaction or social organization”. · Observable differences in any social phenomena over any period of time. · Changes in the social organization, that is, the structure and functions of the society. Social change is the change in society and society is a web of social relationships. Hence, social change is a change in social relationships. Social relationships are social processes, social patterns and social interactions. These include the mutual activities and relations of the various parts of the society. Thus, the term ‘social change’ is used to describe variations of any aspect of social processes, social patterns, social interaction or social organization. · It does not attach any value judgment. · The rate, tempo, speed and extent of change is not uniform. 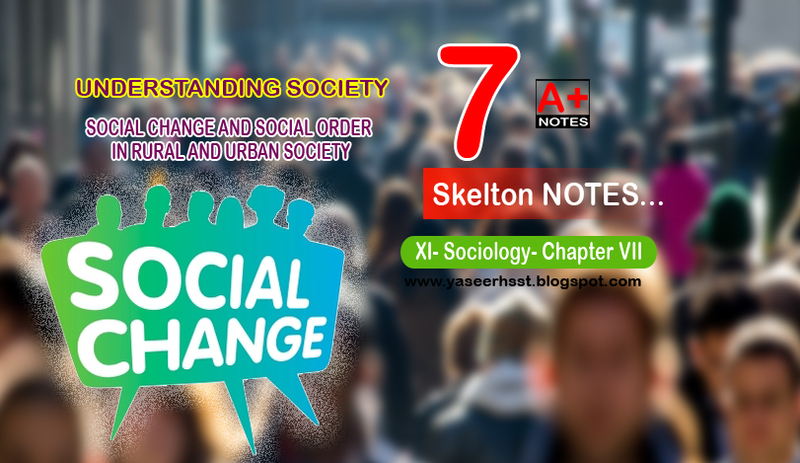 In explaining the concept of social change, sociologists from time to time used words and expressions like evolution, growth, progress, development, revolution etc. discarding one in preference to the other. · Evolution:- Changes taking place slowly over a long period of time. · Revolution:- Changes taking place Rapidly over a short period of time. · Growth is the process of increasing in size. o Biggest political change in history: Universal adult frachise. · Social change has to be contrasted with social order. It has a tendency to resist and regulate change. · It refers to active maintenance and reproduction of particular pattern of social relations and of values and norms. · Some of the things that contribute to keeping societies stable called social order. · Stability requires that people should obey the same rules, and that individuals and institutions should behave in a predictable manner. · There are specific and concrete reasons for society resisting change. o 2) When people are compelled to follow the rules and norms. Every society uses a happy combination of these two methods to maintain social order. · Authority:- the power or right to give orders, make decisions, and enforce obedience. o Max Weber defines authority as legitimate power. That is, power considered to be justified or proper. o Example:- The authority of a judge, a police officer and a teacher. · Law:- the system of rules which a particular country or community recognizes as regulating the actions of its members and which it may enforce by the imposition of penalties. · Contestation refers to broad forms of insistent disagreement. o It includes dissent or protest against laws or lawful authorities. · Crime is an act that violates an existing law. o That breaks the law and social norms. o It can be a challenge to the authority of the state. o Investment in land and technological innovations in agriculture created the possibility of producing surplus. o Advanced division of labour created the need for occupation specialization. o All these changes together shaped the emergence of the village as a population settlement based on a particular form of social organisation. · Low density of population as compared to cities and towns. · Majority of people engaged in non-agricultural pursuits. · Population density i.e. (the number of persons per unit over, such as square km) is higher than villages. · Modern means of communication have reduced distance between villages. · Changes in lower class people status, roles and rights. · Dominant Castes: Term attributed to M.N. Srinivas; refers to landowning intermediate castes that are numerically large and therefore enjoy political dominance in a given region. · National Rural Employment Guarantee act (NREG) 2005. · Before the modern era, trade, religion and warfare were some of the major factors that decided the location and importance of cities. · development of group identities — based on factors like race, religion, ethnicity, caste, region, and of course class — which are all well represented in urban life. · Shortage of housing for the poor leads to homelessness, and the phenomenon of ‘street people’ — those who live and survive on the streets and footpaths, under bridges and flyovers, abandoned buildings and other empty spaces. o It is also the leading cause for the emergence of slums. Though official definitions vary, a slum is a congested, overcrowded neighbourhood with no proper civic facilities (sanitation, water supply, electricity and so on) and homes made of all kinds of building materials ranging from plastic sheets and cardboard to multi-storeyed concrete structures. · Ghetto, Ghettoisation: Originally from the term used for the locality where Jews lived in medieval European cities, today refers to any neighbourhood with a concentration of people of a particular religion, ethnicity, caste or other common identity. Ghettoisation is the process of creation of ghettoes through the conversion of mixed composition neighbourhoods into single community neighbourhoods. · Water, electricity, police, security etc. Urban localities (usually upper class or affluent) sealed off from its surroundings by fences, walls and gates, with controlled entry and exit. · The transport system has a direct impact on the quality of life of the people. · Gentrification means the transformation of lower class area in to middle class and upper class area. · Land developers and real estate people are interested in such transformations because land value is soaring high. · Legitimation: The process of making legitimate, or the grounds on which something is considered legitimate, i.e., proper, just, right etc. · Mass Transit: Modes of fast city transport for large numbers.